LST-848 was laid down by the American Bridge Co. Ambridge Pa. 6 November 1944; launched 21 December; sponsored by Mrs. F. D. Porter; and commissioned 20 January 1945 Lt. R. P. Bentley in command. Following shakedown off Florida LST-848 departed New Orleans 24 February for the Pacific. After touching Balboa C.Z. and West Coast ports she proceeded to Hawaii arriving Kalua Harbor 9 April. For the next 6 weeks she engaged in amphibious exercises in the Hawaiian Islands before sailing to the Marianas. Arriving Guam 11 June LST-848 shuttled troops and equipment from the Marianas to Okinawa for the duration of World War II. When Japan accepted Allied peace terms thereby ending the war the landing ship was assigned to transport occupation forces in the Far East. Operating between the Philippines and Japan LST-848 carried troops vehicles and cargo to support American forces in the Pacific. She departed Japan in early December and after stays at Saipan and Pearl Harbor arrived San Francisco 11 February 1946. Following operations along the West Coast she sailed to Astoria Oreg. early in April and decommissioned at Vancouver Wash. 10 August 1946. 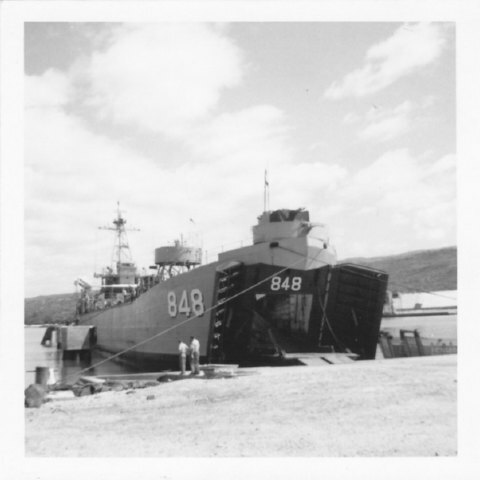 While berthed with the Columbia River group Pacific Reserve Fleet LST-848 was named Jerome County 1 July 1955. Jerome County recommissioned 7 December 1959 Lt. Kenneth H. Ruecker in command; then completed a shakedown along the Pacific coast. On 14 May 1960 she departed San Pedro for mid-Pacific missile operations out of Midway Island. After 5 months in support of the U.S. missile program she returned San Diego late October. During 1961 Jerome County participated in amphibious training exercises along the California coast; then on 12 January 1962 she sailed for the mid-Pacific. Assigned to Operation "Dominic " she performed weather studies charting and communications during the U.S. nuclear tests of that year. The veteran LST returned San Diego 18 August to resume amphibious training exercises. From August 1962 until August 1965 Jerome County usually operated along the West Coast in addition to two mid-Pacific deployments. Following the increased American commitment to assist the South Vietnamese government in their struggle against Communist aggression Jerome County sailed for Southeast Asia 10 August 1965. Arriving Chu Lai South Vietnam 11 September she supported U.S. operations in Asia for the next 3 months. The landing ship returned San Diego 22 December. Jerome County sailed again for the Far East 3 March 1966 and arrived Da Nang South Vietnam 8 April. She unloaded her cargo and continued shuttling supplies ammunition and equipment in and out of the war zone until departing Subic Bay 1 September for home. She arrived San Diego 13 October and operated along the West Coast for the remainder of the year and into 1967 preparing for future action.